Are those two worth upgrading? On rifles I absolutely demand gold caliber for getting as many targets as possible. So to me, the answer is "no". Just wait for 50% weapon cost refund for getting more out of them. Till that time, tell your survivors to scratch their butts with it. For me wide caliber, interrupt, piercing and deadly ( a little less with the badges) are the main requirements. Wide bore is not absolutely necesarry for me(though I really like it, siver is fair enough) and combo of piercing and destructive topped by luck is not bad at all. 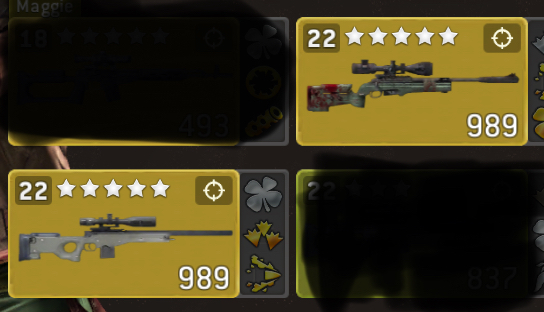 If you want to get yourself nice challenge rifle, I would not say no to either one(gold piercing and gold destructive for me pls), but dont forget, that piercing is not influenced by luck.